Bacterial transformation was first described by Fred Griffith in 1928. His work on Streptococcus pneumonia a bacterium that causes human pneumonia and that can also kill mice revealed the uptake of genetic material from the surroundings by a bacterium caused change in its genotype and phenotype. He called it the “transforming principle”. Look at the figure for details of the experiment. 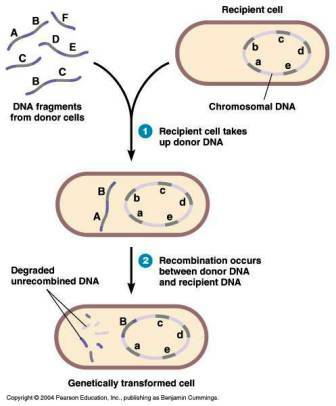 Bacterial transformation involves the transfer of naked DNA from the surroundings into a bacterium. Actually what is happening is that, when a bacterial cell ruptures or undergo lysis, the fragmented bacterial genome may be release into the environment or medium. Not all bacteria can take up these fragments. Only live competent bacterial cells can take up these fragments and later gets integrated into its genome. Competence is the ability of a cell to incorporate naked DNA from the surroundings. Bacteria exhibit this property only at certain stages of life cycle. During the competent state, cells produce certain proteins called competence factors. Functions of competent factors include modification of cell wall so that it can bind to DNA fragments and helps in DNA uptake and incorporation of DNA. Any DNA fragment that has been transferred from a donor cell to recipient cell is exogenote. Native DNA of recipient bacterial cell is the endogenote. In this gene transfer, only a part of the donor genome is received by the recipient. The resultant partial diploids are referred as merozygotes. Any process of genetic exchange that transfers only a part of genetic material from one cell to another is called meromixis. The process of transformation is widely employed in genetic engineering to make transformed organisms. Bacterial cells are often made competent by treating with Calcium chloride followed by heat shock treatment. In short transformation is the process by which DNA fragments are taken up and incorporated by a cell. Now let us discuss the second mechanism of genetic recombination in bacteria and that is transduction.